User Review: "Marketo for growing organizations"
Marketo is used within our marketing operations today for three primary purposes. First, we track the effectiveness of our marketing programs and progress towards overall department goals. Second, we generate a greater volume of new business leads through content marketing, nurturing, and lead scoring processes. Third, we increase engagement with customers through targeted email communication. Marketo provides one central system to maintain marketing data and the operational execution of marketing campaigns. Marketo is an industry leader and continually improves with new features and functionality. This is increasingly the case since the acquisition by Adobe. Marketo integrates with a wide variety of third-party providers that help companies expand capabilities for more specific business needs. Marketo is highly customizable to different business models and marketing process flows. If you can think it, you can pretty much do it in Marketo. Marketo is not the most intuitive system in the world. With the benefit of flexibility comes added complexity. It really takes at least one person within your organization dedicated solely to administering the system. The new Marketo Sky UI definitely is an improvement and will help me, from a CMO perspective, should I ever need to navigate within the system. Using Marketo effectively requires training and practice in the system. There really is nothing in the way of free online tutorials or shortcuts. The user community is GREAT, but expect investments in employee training both in the beginning and ongoing as the system continues to advance. Marketo is great if the organization has the resources to use it. This is typically well-suited for mid-sized to larger marketing departments. Administering the system, from a core functionality perspective, requires at least one full-time employee dedicated to Marketo. You will also want to make sure your sales department is fully utilizing its CRM system since utilizing data from this system in Marketo is important to data insights. Having said that, if you are a growing department with resources committed to making Marketo successful, it is a great tool to build your marketing operation around. At this point in our implementation of Marketo, we are focused on generating quality, timely leads for sales. The system does this very well. For us, we are looking to generate sales to new customers that are at different stages of the buying decision process. Marketo allows us to identify where decision-makers are in the process, but more importantly, provides us the information we need to improve marketing efforts. This could be feedback relating to the success and efficacy of individual programs, or improving our nurturing flows to ensure sales receives the "right" leads at the "right time. Review: "Marketo is the industry leader for a reason"
We use Marketo in all of its glory. We moved from Mautic, and I'd previously moved from Act-On and Pardot. Marketo is a little bit more to bite off and chew for sure, but the payoff is absolutely worth it. Took much longer to implement, but not necessarily to get connected up with Salesforce. We personally don't use Marketo much for landing pages (yet) - we mostly use our CMS, but plan to do some testing with Marketo in the future here. 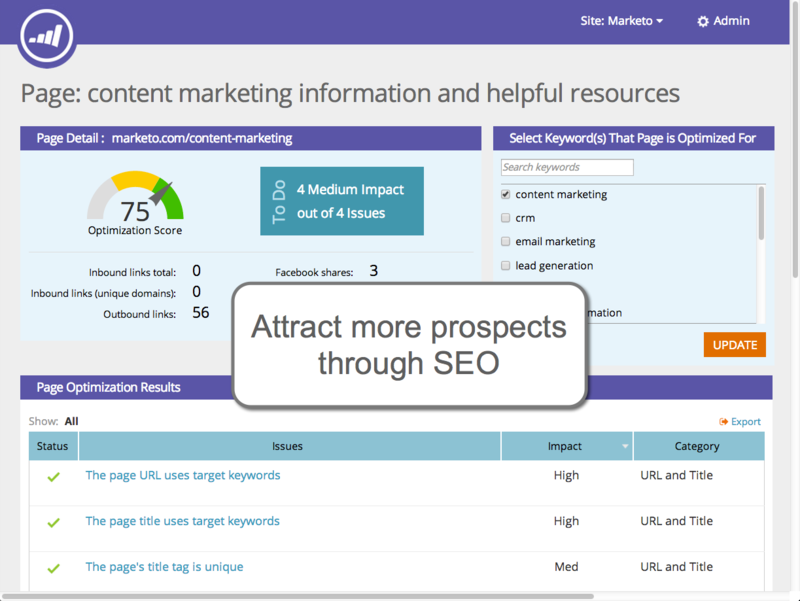 We use Marketo HEAVILY for post form submission automation, data cleanliness, and much of their automation. Love their email WYSIWYG, but like every WYSIWYG, it can have quirks. We paid for their template team to come up with landing page and email templates - well worth it! They also had an implementation team (ours was through LeadMD - 3rd party Marketo services partner), and our experience there was absolutely fantastic!! It took some time to get FULLY off the ground, but we were sending emails within a few days. I would say Marketo can take a little more technical savvy to set up and administer, but for your end users, it's worth it. Automation: unparalleled. The things you're able to do with Marketo can alleviate automation on the Salesforce end, and bring data into the system clean, precise and ready to route before it hits Salesforce. Flexibility: There are SO many things you can do to tweak the system to operate according to your lead / data flow. Targeting - persona, territory, demographic... etc. 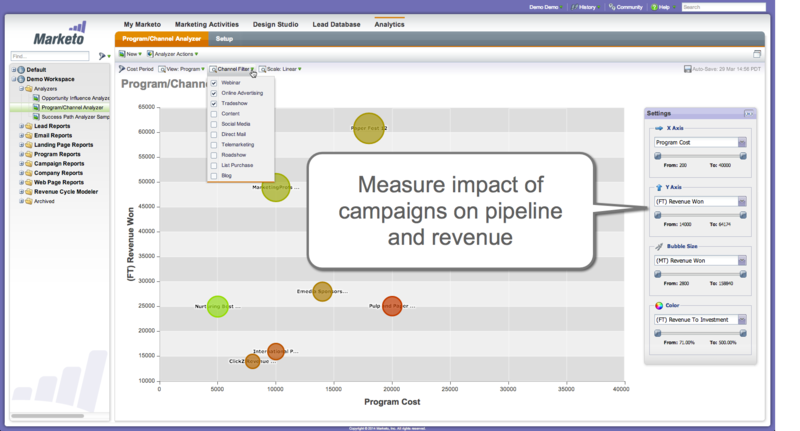 If you have the data, you can easily get Marketo to slice, dice and precisely target your data. Integrations: They have a ton. The ones they don't, there's third party integrations through Zapier that work pretty well. Super happy on this front. Technically heavy. Takes a bit to implement and understand - there's a bit of a learning curve here, and may require some help to stand up and implement. Interface: They just rolled out a new interface, but they definitely have a "database" approach to the software - folders, subfolders, sections... can be confusing at first, but once you learn, you'll be locked in. Rope - you can hang yourself. Need to be methodical and well executed with your campaigns, or you can get yourself into trouble! Salesforce API... I would expect there to be a managed package.. but you set up the system through a traditional API connection. It's cumbersome and timely, but once it's set up, it's definitely rock solid. User Review: "Marketo is a B2B Marketing Superstar!" Marketo is used primarily by the Marketing department, specifically me. I use it to create programs and landing pages, analyze activity, and report to sales and leadership. It allows me to quickly create programs and see metrics related to those programs. Great for full Marketing programming and campaigns. Not a CRM. Our main goals are education of our clients, net new logo acquisition, new offerings, some operational email functions. We also use the landing pages for form captures of information to create hot leads for sales. User Review: "Marketo makes B2B marketing a breeze"
Marketo is being used by our marketing dept to drive automation. 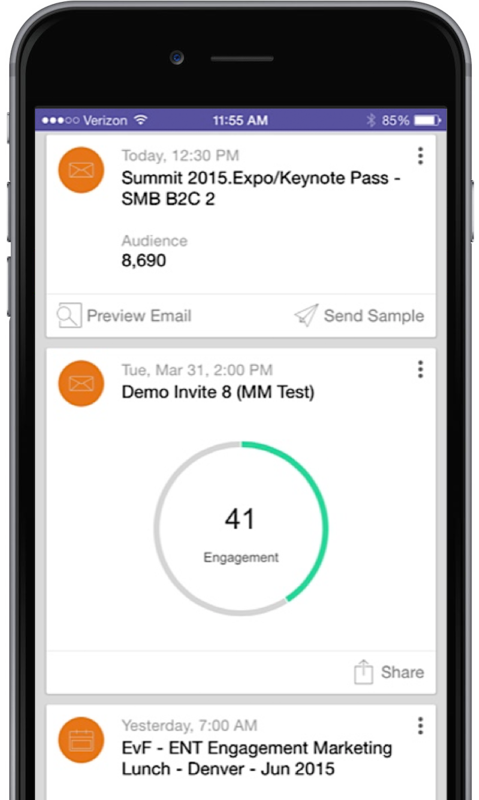 We like that Marketo help us automate our emails and track engagement with our database. The Marketo interface is not intuitive. I wish there were more help tutorials, rather than relying on only the Marketo community. The Marketo community is not always helpful and having a FAQ and help center would be extremely useful. I would like the design studio in Marketo to allow me to replace current images with images with either new file types or file types with varying names. My biggest complaint about Marketo is that there isn't somewhere to go when I need to get help, other than the Marketo Community. Also, the fact that it's not intuitive to use. Setting up drip and nurture campaigns, learning how to use acquisition programs, and also learning how to score someone in Marketo can be difficult. Even the language used in Smartlists is not straightforward. Review: "Marketo is not perfect but beats the competition"
We use Marketo to manage all prospect engagement, including scoring, lifecycle, and lead assignment, besides the assortment of marketing initiatives. It is used mainly by our Marketing department, but there are other users in Sales Ops and Product teams that have access. Flexibility in the way we build smart campaigns and programs. It integrates with many other tools and technologies. Visibility into the history of records or the history of users. It would be great if Marketo could show where tokens were being used. Marketo needs to bring back their anonymous people filters. It would be great if Marketo could improve their support. When I first learned Marketo at the end of 2013, they had excellent support over the phone. Their support has gradually deteriorated over the years. Phone support is now a paid add-on, and their chat and online support seem to be less qualified than previously. It is well suited for companies with complex sales cycles or where complex marketing processes need to be built out. It would not be a good fit for startups with small databases. Bring awareness to our latest product releases; move records through the funnel and create sales opportunities; source new records through marketing campaigns. We have been using Marketo for email marketing but are now learning to use Web Personalization and Content AI. We use it in Marketing but we support all the business units within the company by promoting new products, solutions and events for them. Web Personalization is surprisingly easy to understand, set up and begin. The strengths so far seem to be the ease of use. Within two weeks of implementing the RTP code we have campaigns running and segments catching the users. Running email campaigns through Marketo is simple and easy to do. There are several ways to get to what you need, which is very helpful. Email technical support is great for finding answers to frustrations and problems. They respond in a timely manner. Creating an email within Marketo is frustrating and difficult. We purchased a third-party software that integrates and works wonderfully. I would like this to be a part of the Marketo package instead of having to find a third-party and then purchasing them in addition to Marketo. Marketo is very slow loading pages. We purchased technical support hours and the most frustrating thing was that I couldn't see how many hours I had left. I had to ask. There should be a dashboard in Marketo that keeps track on the hours purchased, used and remaining. Marketo is well suited for providing simple web personalization quickly. The most difficult part is coming up with what would work well or not. There are issues with the segmenting, I don't feel I can trust the location so I am staying away from segmenting by state and city. Country seems to be okay. I also think it is not a great place to view analytics. We are trying to educate our customers about the breadth and depth of our portfolio and assist sales by informing customers about new products and then passing meaningful information onto sales. User Review: "Marketo has pluses and minuses"
We use Marketo to send emails, manage our large customer database, and analyze our marketing effectiveness. It addresses our problem of organizing our very large database (about 10 million contacts), helping us gain insight into what they are doing in our app, and allowing us to segment them so we can best target them. Not being able to edit Email Program campaign limits makes that function completely unusable. This tool is good for larger marketing organizations but is more than a smaller company would need. There are lots of quirks/issues with the tool and it seems like you need someone at the organization who has been using it for a long time and understands the intricacies and limitations. User Review: "Cursory View of Marketo"
Marketo is only being used by the Revenue teams (Sales, Marketing, & Customer Success) at this point. We have mainly leveraged it for managing marketing email campaigns, including webinar promotion, drip campaigns on a specific asset, and various nurture programs. We also use it to manage our MQL and lead scoring programs, as well as an alert routing system for notifying sales when a MQL is ready for follow up. Lead Scoring and MQL management. Alerting Sales of leads ready for follow-up. Search Functionality within the Platform. Quicker Load Time on Smart Lists. I can only speak to how our organization has traditionally and currently leveraged Marketo, which I understand is not taking advantage of the full suite of capabilities that exist within the platform. It is really great at managing and executing on various different types of campaigns such as emails drips, nurture programs, webinar promotion, event tracking. It's also been a great tool for lead scoring and MQL management. Traditionally, we have mainly used Marketo for supporting the sales team's goal of driving net new revenue for the organization. We've done this through email drips, nurture campaigns, and webinar and event promotion. Marketo Review: "Best Overall Marketing Automation Tool with Great Flexibility and Customizability"
Marketo is our main hub of all customer communication. We use it primarily for all of our nurtures, batch campaigns, master routing, task assignment, web forms, webinars, etc. The learning curve for Marketo is relatively low. Intuitive drag and drop on filters and flow steps allow flexibility. It's a powerful tool to append and modify data on a large scale - i.e. change data value if x conditions are met. Batch and Trigger campaigns allow flexibility on schedule. No process visualization of how connected smart campaigns are related each other - you have to rely on a tight naming convention and accurate documentation on your own. Slow loading time of smart lists. Marketo is a great tool for any company that is looking for a true Marketing Automation tool - not just for sending emails. It's a great source as a centralized entry point for your inbound data. Easy to set up nurture programs with some inflexibility. User Review: "Insights about Marketo"
Marketo is used by Marketing team for all the promotional activities and generating leads for sales team. The purpose of using Marketo is campaign management, nurturing and demand generation. It is most suited in a B2B scenario where the number of emails sent is less as compared to B2C, but if you are sending lots of mails per day, Marketo may not be as effective. If analytics is the main requirement then Marketo may not be as effective. lAlso predictive lead scoring is definitely area of concern. User Review: "Marketo Customer Experience"
We use Marketo only in the marketing department to send out external emails to our customers. We use it mainly for product promotions, events, and for new contacts to create an account with us. Doing this helps new and existing customers understand what we truly do and what we have to offer them. We nurture them and help them find what they are looking for. Since we thousands of products in the semiconductor business, it can get a little messy for customers at times. A/B testing: We sometimes think that what we think is right is right, and that customers think like us too. A/B testing proved us wrong. This is an awesome tool to have. Web Personalization: This tool has been helpful for us. We are able to segment our audience and focus on them by personalizing their interests and preferences. This has opened a door for our company. Customer relationships: We truly value our Marketo reps. They make sure they take care of our needs at all times, whether big or small. This is a HUGE strength for Marketo, because not all organizations have this. Also having the Marketo Community has been a huge help for us to be able to ask questions, and at the same time help other users figure things out! Loading time: I tend to wait for Marketo to load each time I take action. For instance, cloning a campaign or approving an email. Error messages: I have this pop-up message saying that I have an error, but there really is no error as far as I can see. It happens at random times too. Marketo Support Chat: The support chat user interface has been changed. It used to be a chat window that connected me to the same people (good relationships! ), now it opens this plain text window and it takes forever to connect to a specialist. We would also get disconnected most of the time. It sometimes takes minutes to reconnect. If not, I have to re-open a support chat again. I created a form for an event, and the customer wanted functionality that if someone had already signed up, a pop-up message or warning message would state that they already signed up. Another thing now is having a payment functionality in the forms. I am not so sure if this is currently possible. In general, we have been using Marketo to promote our brand and products. We have also been creating a bunch of emails and forms for events, such as seminars and tradeshows. Our end-goal, really, is to increase revenue, but currently we are concentrating on telling the world about what we do, what we offer, and how we can help them achieve their goals. 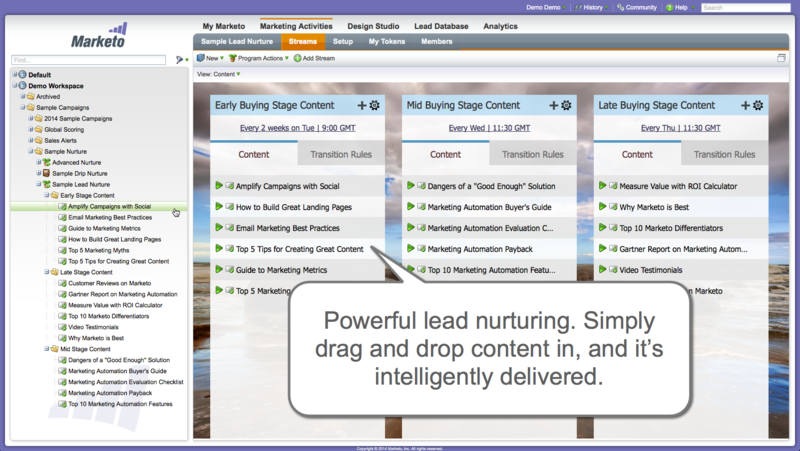 Marketo Review: "Green Manager to Marketing Automation - Power is there but how do I unlock it"
We are using it for newsletters right now but hope to integrate nurture campaigns this year. As we make a shift to our strategy from marketing to consumers to a B2Edu model we are looking to utilize Marketo to manage how we take new and current users on a journey of content distribution. We would like to start making smart lists, audience segmentations, and really customize the experience to turn someone unfamiliar with our brand to someone that is a brand advocacy, helping reduce our cost to find new people that are in need of the products we provide. From what I have seen at the conference the updates to not only the data strength but UI/UX improvements Marketo is going to be a much more powerful tool for even the most green of marketing associates. I honestly have not even thought about using it for any of the following. Something we really need help with is setting up an abandoned cart drip campaign to help individuals find what they need. We know what information they need we just need to implement it in Marketo. After the Summit conference there is some cool stuff I am looking to implement in the near future. User Review: "Marketo Demand Gener"
We use Marketo to manage, engage, and track both our prospective and current client contacts. It's mostly used by Marketing (duh) but through Marketo Sales Insights is extended to our Sales teammates. Marketo primarily solves for lead and demand generation. Landing pages, especially around native builder functionality and ease-of-use, and/or tighter integrations with other third-party tools (e.g., Unbounce, Leadpages). Webinar operations, particularly supporting GoToWebinar's Simulated Live and on-demand webinars (Marketo needs to support GoToWebinar's v2 API). While not at the level of Eloqua, Marketo still requires key support contacts, preferably an internal CRM admin, website admin, HTML coding, search and social managers. User Review: "My relationship with Marketo"
Marketo is our engine for demand generation and is used by the marketing team across various of functions within marketing. Marketo helps with staying engaged with our customers and prospects, scores the person depending on the action taken, and tracks which channel has the biggest impact/ROI. Marketo is great for capturing the original referrer with the Munchkin code to see where the people are coming from. Acquisition program is great to track the new names obtained vs. already in the database. Sending out personalized emails using tokens to bring the best experience for the user. We had a difficult time tracking which channel is performing the best. When we were rearranging the architecture of our CRM and moved from one SFDC to another, we were not aware that it is not a rip and replace but needed a new instance as a whole. Setting up the smart campaigns and overriding some data where it is impossible to revert back to has been challenging. Marketo is well suited for a more mature business rather than an SMB due to the pricing and the robustness of the tool. We are trying to upsell, cross-sell, and always stay on top of mind of the customers and penetrate into the area where they may not know about us yet. We use it for email marketing currently to assist our sales team and also use it for events, promoting and follow up. Just the marketing department owns it, and sales benefits from it as well. It addresses many business problems including lead management and being able to prioritize leads, able to track leads and contacts individual activities. I enjoy the tokens aspect, on an asset, program, and system level. The fact that scoring can be tokenized is amazing. I like the trigger and filter ways of being able to pull lists and create. I like creating landing pages and email templates. Dislike the integration with Dynamics. Dislike that the landing pages and templates are not drag and drop. The analytics section is limited to very high level, would be nice to able to drill down to see a contact or full accounts activities at one time. It is well suited for a B2B setting for lead management and lead gen purposes. We use it for prospecting after events to use for follow up purposes and trying to set a meeting. Marketo is used across the entire university. Our central team started using it before my time and initially had over 430 users on our account. The central team creates the standard templates for Marketo and I customize them for my department. We didn't initially have any governance over Marketo, and my role has been to come in and streamline it for my department. My department has 53 subgroups and we use Marketo for email marketing, event outreach, etc. Currently, my department is only using Marketo for emails and to collect analytics. Marketo is good for sending emails to a very specific set of users and tracking results. We use Marketo for communicating with students, alums, donors, and friends of UW. Marketo Review: "Hoping for more with Adobe"
We are an agency and manage our client's Marketo accounts. We set up the implementation as well as ongoing strategy and execution. Our clients use Marketo across the whole organization and work to help align marketing and sales. Marketo is definitely for enterprise accounts where an organization can spend the time using the tool. Outcomes depend on the client and the campaign. We have clients where lead generation is their main goal and for others it is awareness. User Review: "Make Marketo work for you." The Marketing Operations team within our demand gen team are the only power users within the entire organization. Other members of the marketing team such as the graphic designers and digital marketing team have access. Access to the Marketo community and training docs outside of having a login. This is helpful for users looking for opportunities and someone who is interested in learning more. The Marketo user groups are helpful for users to get to know other users and bounce around ideas and challenges among other Marketers. Drag and drop feature in the engagement program. Engagement-based cadence in the engagement program. More drag and drop options or templated programs for new users. Marketo works well for larger organizations with complex business units. It may be a bit complex for smaller organizations. Using it to increase new sales and upsell/cross-sell customers. We use Marketo to both net new leads and for customers to be able to send targeted emails to them. Marketo Review: "Enhancing our business"
Our organization is in the middle of transitioning from Silverpop to Marketo. However, our entire division uses Marketo. With the transition, it has been difficult to navigate the type of information that needs to be sent to Marketo in order for us to do the campaigns we'd like to do. Also, its difficult for a strategist who does not use Marketo or will not use it directly to imagine what types of campaigns to create without knowing what the capabilities of the program are. If we knew what capabilities Marketo has we'd be better equipped to know how to direct the data integration. Marketo allows for the creation of emails within the platform. I can utilize my creative manager's time elsewhere and not have to focus so closely on individual email creation. Our data is fairly complex. Marketo allows us to be more strategic when implementing new customer campaigns. Our data import has been particularly difficult. A direct contact that would spend the time to direct our efforts would be helpful. We also need to have several layers of email approvals before campaigns are launched. Marketo doesn't have a way for us to create AND approve email segments or art before the campaign's launch. Marketo is well suited for an organization that has an automation manager with previous Marketo experience in using the platform. Also, a direct Marketo contact should be checking in periodically to ensure there are no issues with using the platform. As a strategist, I would also like to have a detailed report of what programs we already have set up in the system and what information is being placed in the email collateral being sent. I have one person in charge of that, but having this type of report would allow for more transparency into our campaigns. Our current programs are for prospecting new customers. However, in the near future, we are looking to nurture our current customers with information about their membership, onboarding new customers to their membership, and newsletter sends (engagement and product usage). In the future, we'd like to be able to send our transactional emails through Marketo. However, we aren't set up for those types of email campaigns in our current instance, which forces us to continue using Transact. User Review: "Marketo admin for a large b2c company"
We use drip nurture campaigns for the B2C portion of our business (we are mostly b2c but also b2b) and heavily rely on transactional emails. We use email performance reports, but rely on Tableau for most of our analytics. The problem right now is the high cost. We have a large DB and find that we don't need most of the products in Marketo. We also find support turn around is a bit too slow. The UI is easy to train on. There's a low barrier of entry for new users that I onboard at the company. Our account manager is friendly and personable. Support is skilled. The tier 3 team are able to operate more like engineers. The support team and account managers are overloaded, so they have slower turn-around times. We do not like to escalate cases, but this is realistically the option that we need when something needs urgent attention. Parts of the UI need updates and give inaccurate information. More transparency in updates is needed. We have had infrastructure changes break our campaigns. I think Marketo is great for SMBs that need a product to sync with Salesforce for their sales team, but it is not ideal perhaps for larger companies that should be using a different tool for email. The third-party integrations are stronger than the products available out of the box in Marketo. I also find the documentation to be lacking. We currently have revenue explorer, and I have no idea how to set it up for my company because the docs are bareboned. Used to convert leads into customers and to increase revenue within existing customers. User Review: "Without Marketo, we don't exist." We are a platinum Marketo partner, and everyone at our company uses Marketo every single day. It fuels almost our entire consulting business. We have built out our entire "Gold Standard" framework around lead scoring, lead sourcing, lifecycle management, database management, and lead nurturing. We are currently solving for a lot of integration issues for Dynamics CRM, SFDC and integrations with webinars provided like On24, Zoom, and WebEx. Lifecycle management. The lifecycle model works really well and, when set up correctly, you are able to report on funnel velocity. Lead scoring. 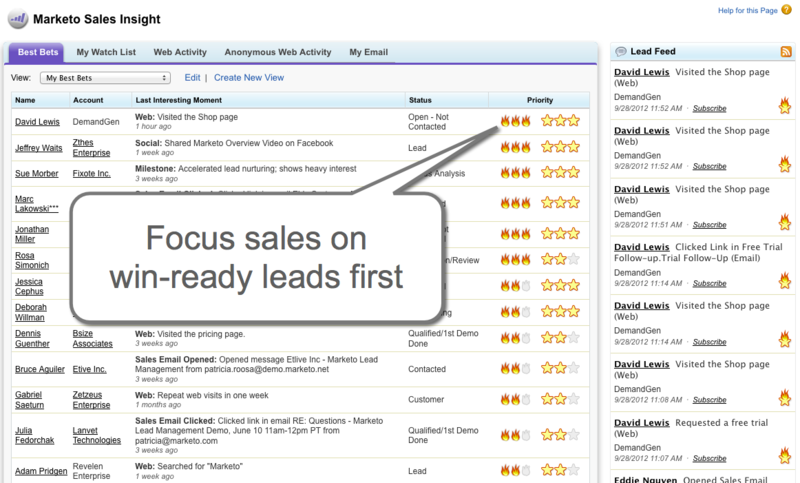 Marketo is able to accurately lead score and push into CRM. Lead Sourcing. Marketo allows you to identify all net new leads that come into your system and assign an acquisition program. RCE reporting. Enhancing this portion of the system and making it more user-friendly will allow people to easily buy into the analytics side of Marketo. Sky is coming into play and should solve this issue but once again, it does make it difficult for everyday users to easily understand the platform. Dynamics integration. This integration is very difficult to operate without someone with strong coding skills. Suited for medium to enterprise level B2B businesses. Marketo does drive our marketing, but more so we use it to solve business problems for our entire consulting business. Review: "Marketo: Great Services, Sub-Par Navigation"
Since our organization is relatively small, Marketo is only used by one or two employees at a time. We use it to basically replace an email marketer. We also have recently used it for lead management and to replace using both Gravityforms and Zapier. Marketo is used for emails, form management, and we are looking to do web design. Marketo has been great for managing and personalizing our emails. This is a huge strength because it allows employees to work "smarter, not harder." Removing the need for an email specialist has allowed our marketing team to create emails quickly and easily, letting them focus their efforts on other things. Marketo's tracking technology is superb. We have been able to greatly increase our understanding of where customers are coming from and what brings them to our sites. Marketo also gives us the opportunity to A/B test easily. The traditional A/B testing method takes quite a while and requires one of our employees to gather and monitor data. Marketo comes in and gives us an option to do the testing without having to worry about generating our own results and focus on other tasks. THE INTERFACE! I know Marketo is a huge program, but it is not easy to learn or navigate without assistance from another employee at first. Marketo needs better online training courses. I have personally tried Marketo University and think it needs a lot of work. I would like videos of how to create a campaign, how to create and design and email, how to go through an entire A/B test campaign, etc. The current videos and written guides are either like a 101 course or immediately jump to higher levels. Easier email creation. Even if we use a template created ourselves or created by Marketo, it would be nice to have more options to drag and drop in the email vs JUST having the modules in the template. Sometimes you want things to look similar, but differ it up a little bit without having to code something in yourself. Marketo is well suited for any company that is looking to get more done with less. Our company is relatively small and continuously finds ways to utilize Marketo programs to cut down on the amount of labor-filled work each marketing employee does. We are using Marketo to reach back out to customers that are working their way through our funnel. Marketo's automated email campaigns have allowed us to automatically reach out to those who may be stuck within our systems that we would have had to manually reach out to before. Having Marketo has increased our close rate within the first year of use. We want to continue utilizing this, but increase our close rate even further by using more dynamic and personalized emails. Review: "Marketo saved us from hiring more staff!" It is being used to send constant emails via campaigns, and triggers within Salesforce. We originally bought it to use to send all of our follow-up emails, which helped us not have to hire a second person. It instantly helped us get our leads back on track, and helps with any issues they might not have reached out to us themselves about. It helps us with the day-to-day follow-ups once apps and quotes have been sent out. We don't have the time to physically reach out to everyone on a day-to-day basis. Campaigns: the triggers to data changes make campaigns easy. You can customize them so much it helps with speaking to each client. Analytics: if you use landing pages or forms it tracks the leads very accurately. Segmentation: it's very easy to customize everything based on any data point you currently track. Reports: they are way too generic and don't show detail like I would want. I need more customization on the current reports. I want to sort them by columns that aren't currently sortable. The user-friendliness isn't the best. Things don't necessarily make sense in terms of where they are located or how they are laid out. How-to guides: They are a little too basic, hard to really figure anything out with, and when you ask on the community forums you get insane workarounds with multiple steps. It's great to continuously have contact with your prospects through the lead process. You can personalize the emails in such detail that the prospect won't know it's "automated." The trigger-based steps are a great way to keep things moving forward. I truly believe that people won't reach out to you if there is a problem in the process on their own, but if they get an email with good timing, they will let you know how they are really doing. We are trying to convert a lead that is interested in our services to actually sign up for one of our programs. We stay in constant contact with the prospects throughout the process, as we are a broker for certain services. We are matching up the lead to the company that will meet their financial needs. By staying in contact, we are able to either help them with the process, or fit them with another program if the first didn't meet their needs. Marketo Review: "More power than we can handle"
Marketo is used mostly by marketing, and I am the main user in my company. We have it integrated into Outlook on a limited basis for sales to send customized emails to prospects, but the major use of Marketo for us is as our main ESP and automation platform. Currently, it solves the problem of getting customized messages out to a large number of contacts efficiently. Automated messaging flows: the ability to create messaging flows and timing, and have them trigger automatically based on custom criteria. Advanced messaging customization: Velocity helps me bring the ability to craft a message in different ways to fit my target markets. Lead scoring: Despite us not utilizing this feature to the fullest yet, we still have a very basic implementation running in the background that is there when we need it to help us find the right people to contact at the right time. SFDC Custom Object Sync: This is a pretty big pain point for us right now. We have referrals in SFDC as a custom object, but are still having trouble automating the messaging in Marketo because of issues syncing the CO to Marketo. Along those lines, it would be cool to see some sort of referral program integration that could help us define the messaging and flows from Marketo. Better access to information on how to use Marketo. It can be pretty frustrating to want to be able to implement something, but to then run into an issue with very little documentation, and the only other way to get information is to pay for consulting. Marketo is fantastic for all our email and messaging automation and customization needs, but our integration with our websites could be better. We've run into issues bringing some functionality to our websites that seem to be limited to only Marketo landing pages. Product launches: Informative, and increase customer adoption. Upsell: Increase post-shoot revenue with our more profitable virtual staging options. Lead management: Brings new leads, and guides them through the funnel to try, and ultimately stay with, VHT. Prospecting: Gaining information on new brokerages, and qualifying them for sales to pursue signing a program with them. Marketo is a leading marketing automation platform with a range of capabilities for small and medium businesses and large enterprises, across various industries. Some common features include email marketing, nurturing, SEO, landing pages, scoring, and analytics while other editions offer advanced features such as website personalization, mobile engagement, social and web retargeting. Typical customers include both B2C and B2B brands of all sizes. Has featureAttract - Your potential customers are out there researching solutions. Help them find and learn about yours more easily. Has featureEngage - Easily build automated campaigns that engage prospects in a personalized way, without help from IT. Has featureDrive Revenue - Convert more potential buyers into customers by triggering a relevant message at exactly the right time. Has featureMeasure and Optimize - Move beyond opens and clicks. Quickly determine how each of your campaigns and channels impact revenue. Marketo SEO - Marketo helps you generate demand via SEO through search marketing, landing pages and forms, social marketing, and website visitor tracking.Marketo Lead Nurturing - Marketo includes advanced segementation, targeting, and personalization campaigns that ensure your marketing messages get to the right prospects at the right time.Marketo Lead Scoring - Marketo dynamically scores your leads in real-time and can trigger a timely sales call based on website or other activity - all integrated with your CRM.Marketo Analytics - Advanced Marketing Analytics drive beyond superficial metrics to inform actual closed-loop revenue impact of your marketing efforts.Marketo Moments - Stay in touch with your marketing efforts anywhere, anytime with a mobile app designed to deliver timely, actionable insights. For the Enterprise edition, contact Marketo for a custom quote.